You’ll remember two critical pieces of flood mitigation were completed in Eau Claire late last year; West Eau Claire Park and the Centre Street Bridge barrier. Now the city needs your input on the next phase: extending the Eau Claire Promenade to the Reconciliation Bridge. 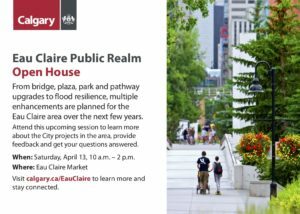 The city is hosting a public house to get public feedback on the design of the Promenade extension and other projects in the Eau Claire area.